Top forecasters are saying it could be an extremely active 2013 Atlantic hurricane season, with the National Hurricane Center on May 23 predicting that up to 20 named storms will develop this year, with between seven to 11 of the systems expected to become hurricanes. No matter how accurate the forecast turns out to be, Hurricane Sandy taught us that it only takes one major storm to kill more than 70 people in this country, injure hundreds of others, and inflict billions of dollars in damages. If one hurricane could do so much damage in the U.S., imagine the impact of similar storms on less developed countries. 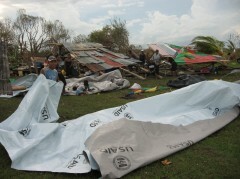 USAID is prepared to meet the demands of an active hurricane season. All year, experts with USAID’s Office of U.S. Foreign Disaster Assistance (USAID/OFDA) have been working closely with countries in Latin America and the Caribbean to make sure emergency and evacuation plans are in place. 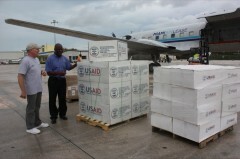 USAID has emergency stockpiles in Miami, including medical supplies, hygiene kits, shelter materials, and water purification equipment. We have the ability to charter planes in eight different countries to deliver these life-saving items quickly to countries hit hard by hurricanes. When we know a storm is coming, we can pre-position staff and relief supplies to provide immediate assistance. But arguably, the most vital resource USAID has is its people. In addition to the 25 disaster experts USAID/OFDA has in the region, there are also about 350 consultants in 28 countries who can immediately jump into the action when a hurricane makes landfall. These consultants live in the region, so they know the country, culture and local officials and can quickly report the conditions on the ground and help USAID prioritize humanitarian needs. All this week, we will be highlighting what USAID and its partners are doing in preparation for the 2013 Atlantic hurricane season, from protecting people from deadly flash floods to teaching children in Jamaica to become the next generation of disaster experts.